All politics are identity politics. I grew up in Minnesota, but moved away in 1998; today my connection to the state is not much more profound than following the local news and avidly watching Minnesota Twins baseball games. And yet as I watched the Wisconsin protests against Governor Scott Walker’s union-busting in early 2011, I felt a mixture of pride, shame and jealousy: the same emotions that many Egyptian activists described feeling as their Tunisian neighbors took the lead in making political change in the Middle East. Perhaps, in that intersection between an emotional connection to the Midwest and an intellectual commitment to leftist politics, the events in Wisconsin hold a clue to solving the great riddle of the twenty-first century left: the missing collective agent of anti-capitalist transformation. The absence of the revolutionary agent is arguably the central problem of the Left since the 1960s. Since that time, the diagnosis and critique of capitalism has been updated and rendered in ever-increasing sophistication, as the cycles and crises and ideologies of capital accumulation have been theorized by the likes of David Harvey and Fredric Jameson. Nor is there a shortage of models of how a better society might be constructed from elements that already exist in the present; these range from the detailed blueprints of Albert and Hahnel’s Parecon to the open-ended framework of Erik Olin Wright’s Real Utopias . What is lacking is the organized mass constituency capable of effecting the transition out of capitalism and into something better. In earlier generations, the Marxist Left had a concept of such a collective revolutionary agent, which they called “the working class.” But it is important to understand what this label signified in political terms. It did not simply mean class in the structural sense: workers who survive by selling their wage labor, confronting capitalists whose wealth comes from hiring that labor and producing for profit. The working class in that sense encompasses the vast majority even in the rich countries, but it has no sense of shared collective identity and hence is politically inert — it is a class “in itself” rather than “for itself,” to use the old Marxist jargon. Hardt, Negri, Virno, and other contemporary theorists of the “multitude” gesture at something like this all-encompassing version of the working class, but in their hands the category expresses a hope for a future politics more than it identifies a concrete and existing collective agent. The working class as it existed in Old Left political discourse was a sociological category, and it often referred to a specific type of wage labor: the industrial proletariat, employed in large-scale factory work. Such workers were thought to be the leading edge of socialist politics not merely because they were exploited by capital, but because they occupied a specific environment that tended to forge a collective identity and to facilitate disruptive mass action: factories in which workers were employed for a long period of time, and where they were massed together each day performing similar, routinized work. The working class in this specific sociological sense has lost its political centrality both because of structural changes in the economy, and due to the transformation of political consciousness on the Left. Capitalism has increasingly replaced industrial workers with machines, and as a result the economy is more-and-more dominated by culture industry and service employment that is not conducive to fostering solidarity in the way the old factory model was. At the same time, the work of national liberation and feminist movements has forced an acknowledgment that the older conception of the working class implied the centrality of a particular white, male labor aristocracy, rendering invisible both unpaid labor in the household and the role of white supremacy in excluding non-whites from the most privileged sectors of the economy. However much the Old Left liked to portray the “working class” as a universal identity that subsumed particular interests — and as much as contemporary left nostalgics like Walter Benn Michaels might still like to portray it that way — the working class in its sociological sense was always a form of identity politics. To call working class politics a form of identity politics is not, however, to dismiss it. Indeed, all successful political movements rely on the construction of what historian Benedict Anderson refers to as an “imagined community.” Anderson coined the term in his book of the same name, where it referred to the concept of a “nation”: the objective of the book was to explain why “since World War II every successful revolution has defined itself in national terms.” But Anderson’s definition applies not only to nationalism, but to any kind of collective political identity of the sort necessary for a successful political movement. A nation, Anderson proposed, is an imagined community that is conceived as both limited and sovereign. It is imagined because even in the smallest country, we have no chance of knowing more than a tiny proportion of the people who make up “our” community. And yet we do think of it as our community, and experience feelings of commonality and solidarity with these people we will never know. But the community of the nation is also limited, rather than encompassing the whole of humanity. For it would be hard to sustain the sense of unity and purpose in an imaginary collective if it could not contrast itself with other communities from which it differed. On the Left, unease with nationalism — and imaginary identities generally — has taken two forms. The first is a distrust of any politics not explicitly based on the opposition between labor and capital, on the grounds that such movements merely facilitate the efforts of various national bourgeoisies as they seek to obscure class conflict. The second is a rejection of the idea of any “limited” community, based on the fear that such a notion of difference inevitably leads to violence and repression on the basis of group identity — a fear that is certainly not unfounded given the experience of the twentieth century. For leftists of a certain stripe, the only collectivity in which it is acceptable to claim membership is the whole of humanity. As to the fear that identity politics is just a cover for bourgeois ideology, certainly it can be that. But so too can class politics, as in the distorted pro-corporate populism of the American “Tea Party” Right. And insofar as class identity is always the identity of a particular sociological class rather than the working class in general, it too can be a cover for preserving the privileges of a certain class stratum. Simply proclaiming that a movement is class-based does not resolve the question of constructing an imagined community but merely begs it: people must still come to see their class as encompassing others who differ from them by their race or gender or citizenship or position in the labor market. Can we imagine our communities as limited, without thereby imagining them as dominant over other communities? The history of nationalist movements in state power is discouraging on this score, but perhaps Americans can find a more promising example closer to home. When we think of nationalism in the United States, we generally think of its reactionary manifestation as American nationalism: flag-waving, jingoistic, pro-business, and all the rest. But for all that the residents of the country see themselves as Americans, the United States is also home to a robust collection of regional identities, which may be more promising avenues for progressive development. And the maintenance of these identities is not generally accompanied by a desire to dominate or destroy all others. Think, for example, of the most prominent way in which regional identity is expressed: supporting local sports franchises. Rivalries between cities and states are subjects of friendly competition, rather than visceral hatred. That such regional identities can have political salience is the lesson of the protests in Wisconsin. These contests were generally discussed in terms of the opposition between Republicans and Democrats, or perhaps between capital and labor. But while the protests were about these things, they were also about what the culture of Wisconsin is and should be, and the politics of the protests were often represented as a manifestation of Wisconsin-ness itself. Perhaps the most widely propagated symbol of the protests was the cheese-head hat, which is the distinctive accessory of Green Bay Packers football fans and which appeared at Wisconsin solidarity protests around the country. When members of the Packers came out in support of the protests, the importance of their comments derived not just from their celebrity status but from their position as figureheads of one of the most prestigious institutions in the state. 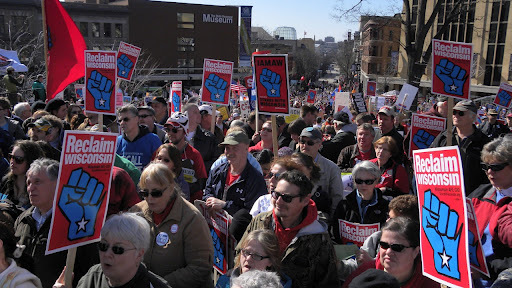 At a more sophisticated level, the historian Christopher Phelps argues that the protests drew strength and legitimacy from a particular set of shared norms unique to Wisconsin: the “Wisconsin idea,” a left-populist notion that both government and economy should be accountable to the common man. The Idea goes back to the early twentieth century politician Robert La Follette; it is taught in Wisconsin schools and is often invoked to describe the mission of the state University system. There is nothing inherently exclusionary or chauvinist about the Wisconsin Idea; its purpose is to provide a big tent in which all Wisconsinites can define themselves as part of an imagined community with shared progressive values. To root left politics in the communal identity of states and regions may seem anachronistic, and it cuts against a common socialist and Marxist preoccupation with rooting politics in the workplace. But just as the sociological working class of Old Left imagination was only a particular idiosyncratic manifestation of the underlying structural opposition between capital and labor, so too the identification between class politics and action at the point of production is tied to a particular historical era. Struggles over urban development, environmental justice, or the welfare state are just as much class struggles as are strikes or other workplace actions. Hence it is necessary to imagine a political identity that encompasses the entire dynamic of production and reproduction beyond the factory floor. In recognition of this fact, many activists today speak vaguely about “the community.” But better to give the community a name, a place, a history, and a set of symbols that can be drawn on as part of a political struggle — hence, the Wisconsin Idea. Other states and regions will have to find their own usable past in order to forge a viable progressive identity. In the mountain West, there is the radical labor tradition of Wobblies and coal miners. The contemporary culture of Northern California and the Pacific Northwest, while often derided as mere hippie narcissism, can form the basis for a more substantive politics of progressive cosmopolitanism. In the Northeast, there is a Yankee radical tradition of labor-artisan republicanism, dating back to revolutionary times, alongside the proud history of abolitionism. Appalachia, today a hotbed of white racial resentment, has a storied history of labor struggle as well. There are even elements of a progressive identity in the South, which is dominated by a reactionary local political identity and is in many ways the well-spring of contemporary right-wing American nationalism: a Southern counter-history runs from the Maroon communities of escaped slaves and Indians all the way through the Student Non-Violent Coordinating Committee. Whatever identity we construct will be, as Benedict Anderson put it, imaginary; as postmodern, ironic subjects, we will be unable to avoid facing the artificiality of our identities. And this is just as well, because we will have to be self-conscious about constructing a new identity rather than finding one already made: to appropriate the past uncritically would be to exclude all those who were excluded in the past. A modern “Wisconsin Idea,” for example, must encompass the poorest neighborhoods of Milwaukee and the Hmong immigrants of western Wisconsin, just as much as the stout rural dairy farmer. Fortunately, the power of nationalism does not actually depend on positing some primordial past or an authentic tie to the land; it is possible to feel an identity even after knowing that it is constructed and artificial. Certainly my own feelings about Minnesota feel no less real for all that I know that they are imaginary. Just as Egyptians in Tahrir Square spoke of their vision for change in the whole Middle East, I have my own dreams about change in the Middle West. And when Minnesotans rise up to overthrow their own corrupt and complacent elites, I will be on the first flight back to join them.